The liquid salt mixture is a key thorium MSR characteristic. The online reprocessing or cleaning of the salt may be essential to fully realize the benefits of the thorium cycle. The processes to achieve this are currently still maturing or being developed. For cleaning/manipulation to be possible, the thorium MSR requires a chemical processing installation parallel to the nuclear power reactor. Although cleansing of fuel was also part of the Molten Salt Reactor Experiment that ran in Oak Ridge in the 1960’s, this was achieved in a separate installation and happened by the batch rather than continuously, which is what could be required in some of the current MSR designs. More research is needed to further develop a chemical processing installation suitable for full-scale, power generating thorium MSRs. Many of the necessary technical, chemical and safety processes and procedures still need to be developed, tested and regulated. That does not mean this is an insurmountable obstacle. Molten salts are familiar technology and routinely used in other industries like aluminium production. Time, funding and research are needed to work out what is needed to build the chemical processing installation. 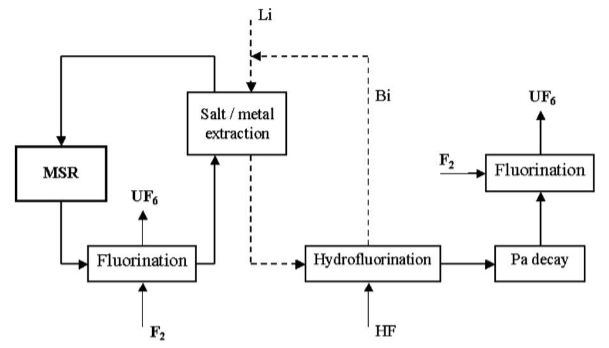 One way of removing unwanted fission products (not actinides) that shows promise is a process called “helium bubbling”, a technique where helium gas is led through the salt mixture, “pushing” solid particles of fission by-products out of the salt mixture (Uhlir, 2007), (Delpech, et al., 2009), (Hargraves & Moir, 2010), (Serp, et al., 2014), (Journée, 2014). Another point of interest is the material that is to be used for containing the liquid fluoride mixture. The mixture is very toxic, corrosive, hot, and radioactive, requiring a material that is able to withstand all of these influences for years. The material that was used in the Oak Ridge Molten Salt Reactor Experiment was the incredibly durable alloy “Hastelloy-N”. Apart from some minor adjustments to the material to improve its radiation resistance that were made later, the alloy showed a satisfactory performance. However, the Hastelloy-N was subject to radiation hardening and tellurium corrosion. The latter was solved but the solution has not been tested by Oak Ridge researchers. Nonetheless material concerns remain in light of a desired reactor lifetime of 30-60 years, and the harsh conditions in a MSR system, as exemplified by Prof. Dr. Sietsma (2015). Some MSR start-ups therefore adopt a timely replacement strategy for system components, or the system as a whole. Modern increased safety measures will likely require renewed rigorous testing and the development of physical models to predict the material’s behavior over decades but a suitable material can probably be found. For an alloy to be suitable it is important that it contain as few as possible elements that can be “activated” (Macpherson 1985), (LeBlanc, 2009), (Sietsma, 2015). FLiBe, one of the candidate salts, contains the element beryllium, which is highly toxic. It therefore requires careful handling, and fool proof containment. This type of handling is routinely done in industries like aluminium production so it is possible, but it will raise security requirements and increase overall complexity. This is why using an alternative to beryllium might be desirable. A possibility is FliNAK, a LiF-NaF-KF mixture , which increases the melting point a little but also has additional benefits (Leblanc, 2009, p. 1655), (Merle-Lucotte, et al., 2012, p. 2). The graphite that serves as a moderator and neutron reflector in the LFTR is damaged under the influence of fast neutrons (Kasten, 1969, p. 1). Because of this the materials shrinks and swells, embrittles and changes properties. Another concern is the penetration of salts/actinides/fission products in the graphite is undesirable. This requires extensive and representative characterisation to select the right graphite and maximize graphite lifetime. It has to be refreshed once every 20 years, and damaged graphite needs to be stored. Thorium is a fertile element, not a fissile element. This means that in order to use the energy from the thorium, it must first be transformed into the reactor fuel uranium-233 (233U). To start this transformation, the thorium needs to catch a neutron. To initiate this process, another reactor fuel will be needed. This means that Thorium-MSR’s require start-up uranium fuel to initiate the nuclear chain reaction. Critics have expressed concerns that there is not sufficient 233U to initiate enough thorium-MSR’s within a reasonable time frame. However, there are several solutions for this issue. One is to breed 233U in existing reactors. Other options include using 235U or plutonium based fuel mixtures after which the MSR acts as a breeder. Lastly the MSR may function as a waste annihilating reactor, running on non-vitrified nuclear waste such as plutonium stockpiles as proposed by Transatomic Power (Haubenreich & Engel, 1969), (Rosenthal, et al., 1969), (Leblanc, 2009), (Hargraves & Moir, 2010). Although a test reactor was successfully operated in the 1960’s during the Molten Salt Reactor Experiment, the MSR will still require substantial investment of time until commercial deployment. This is likely to be on the order of 2 decades or more under ideal support conditions, although estimates vary. The Chinese MSR development program estimates market entry around 2030, so about 20 years from 2011 when the programme commenced. TU Delft’s professor Kloosterman estimates that it is technically feasible to build a demonstration reactor within ten years under ideal support conditions, availability of experienced personnel and test facilities, so development is likely to take longer in absence of those. The most optimistic estimates come from MSR start-ups, where many predict a finished prototype or commercial deployment in the 2020’s, i.e. 5-15 years from now. It should be noted however that these companies, even though working on molten salt reactor designs, mostly base their technology on the uranium/plutonium fuel cycle, and thus are able to build on a fuel cycle that is very well known, and does not require the more complex initiation of the thorium fuel cycle. These designs are expected not to have all of the advantages of the thorium MSR however. The longest recorded estimate is for the European Molten Salt Fast Reactor design which suggests commercial deployment around 2045-2050. This a molten salt reactor with a fast neutron spectrum, which could well be more difficult to realize than the thermal spectrum MSR and take more time to develop. The design is nevertheless pursued because it offers the advantage of a closed plutonium uranium cycle, in line with the existing fuel cycle and fuel (waste) available in many countries (Gen IV International Forum, 2014) (Adams, 2015) (LeBlanc, 2015) (Transatomic Power, 2016) (IThEO, 2015) (Kloosterman, 2016).